Today was a special day at church. There was a baptism and a Godspeed farewell to several members at our church. A little later this week, I will share a simple little project that I made for the use as part of the order of Holy Baptism. For today however, I thought I would talk about a different matter that came up. While I was talking over the little white garment used for the Order of Holy Baptism, I was told about a problem with the church’s linens. The topic of concern with the altar guild was, “The Case of the Disappearing Purificators.” One by one, the Purificators have been lost, gone missing, or strayed from their home in the Sacristy. To get to the bottom of the issue, let’s ask the famous detective questions of Who, What, Where, When, and Why. The Who – let’s skip this. No pointing fingers here. What – that is a much better question. Yes, following the Service of Holy Communion, the altar is cleared and the Purificator finds its way off the altar. Next question – Where. Where does the Purificator go upon leaving the altar? Answer, back to the Sacristy. Being soiled with Red Wine stains, it finds its way….. into a ZIP-LOCK BAG. When – (opps – just answered that above – ZIP-LOCK BAG in Sacristy after service is over). Great. Got it on that one. Next question? Why – Hmm… This is a tough one. There is a bit of tradition. It’s always been done this way. Nothing is laundered at church. Place the Purificator in a baggy to keep it clean to take it home to launder. Baggy keeps it clean. And there it sits for a week, in a baggy, until it is the weekend and time to set up communion for service on Sunday. Got to remember to pull out the Purificator and wash it and GASP!!*#!!! – the Purificator has mildew stains! That can never go back to church! Now what? – sneak over the church early and use a Purificator that is in the drawer? Yep. That will work. And so the story goes…………………………………………..
Yep, if the Purificator went home without being in the zip-lock bag, many more would find their way home, back to the Sacristy where they belong. We’ve had a little fun sharing the story of how linens might go missing from the Sacristy. Later, I will share a solution I learned from a dear friend on how to help keep little linen items at home in the Sacristy where they belong. 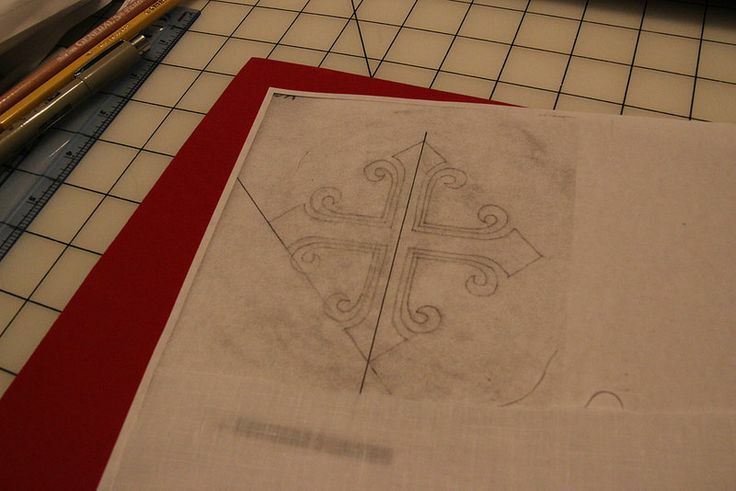 For now, here is a photo of a new Purificator embroidery design. This will be started in a day or so to help replace those items that have gone astray. Thanks for reading and joining in on a little light-hearted fun today.